Dr. Julieta B. Tendero (2nd from right) is named “Accredited Asian Peer Reviewer” and given an “Award of Distinction” as International Accreditor by (from left) Dr. Genaro V. Japos, PAIR and IAMURE president; Dr. Veneracion G. Cabanra and Dr. Djuwari. 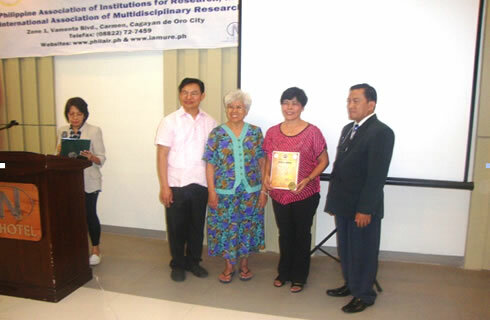 Dr. Julieta B. Tendero and Prof. Ardel S. Barre, researchers of the Western Mindanao State University (WMSU) were given Awards of Distinction each as Asian Peer Reviewer and as International Accreditor, after having completed the Training on International Accreditation of Academic Journals which was held on September 26 to 28 in Cagayan de Oro City. The certificate of accreditation as Asian Peer Reviewer was given by the International Association of Multidisciplinary Research (IAMURE), the Philippine Association of Institutions for Research (PAIR), and the International Accreditation of Academic Journals (IAAJ). It authorizes the holder to perform accreditation reviews of research publications from September 26, 2011 to September 26, 2012. On the other hand, the Award of Distinction authorizes the holder to perform accreditation duties to member institutions of IAMURE from October 1, 2011 to October 1, 2013, in the home country (Philippines) and overseas. It was given by IAMURE, the IAAJ and the Commission on Higher Education (CHED). Dr. Tendero is director of the Research Utilization, Production and Information Dissemination (RUPID) office and editor-in-chief of the WMSU Research Journal. Prof. Barre, on the other hand, is associate dean, Research Development and Evaluation Center (RDEC)and member of the editorial board of the same publication. RUPID and RDEC ate under the Office of the Vice-President for Research, Extension and Development. According to Dr. Tendero, for one to qualify for the awards, he/she should have at least one research work uploaded in the Google Scholar website, among other requirements. The training on accreditation of academic journals was conducted by IAAJ in cooperation with IAMURE, CHED Region X, PAIR and the National Research Council of the Philippines (NCRP).